Topic started 9 months ago by Remy in Experience and Innocence tour. Since then 1,961 posts have been made by 222 users. So who was the director in Washington ? Corbijn, like the JT30 DVD ? Or someone else. That's unknown at this point. Haven't read anything about it. It wasn't Corbijn, he hasn't been spotted. Hamish was only a consultant. Originally posted by deanallison :I’ve been reliving it through some videos too and stumbled across this one of pride, just listen to the oh’s 3 minutes in, sensational. This was a view not too dissimilar to my own on the night. The guys in Pride video who are jumping the most in light blue T-shirts (on GA behind The Edge) are me and 11 of my friends. You can see us clearly from 2:05 on. At the end we couldn't keep our T-shirts on anymore. This was one of my favourite U2 gigs and also very emotional. I also recorded one song. It's not in HD but it catches the love atmosphere which was in the arena. You guys were awesome. I think I saw you all go crazy during NYD too. Was great to see. Awesome, your bright colours and enthusiasm might help you make it on to the dvd, that would be cool. Being one of my favourite songs of the tour I had already stumbled across the video you have posted, thank you for recording it, it does indeed capture the atmosphere on the night. We were jumping all the time ... even during The best thing. One of my friends fell off a rented bike really badly in Berlin on August 31st, then went to both Berlin gigs (he was with me on GA), came home and the doctor told him he had broken his hip. He had the operation the following week, so he was using his crutches at both Belfast gigs and also at the last Berlin gig. He couldn't help himself and waved a few times with them but the security wasn't too happy about it, so he put them down. When the band came in on Stay I was surprisingly taken aback to Dublin in 1993...I closed my eyes and suddenly I remembered the view I had of them playing on the b-Stage at the RDS... the weather, the sound, the slight breeze... a very intense flashback moment. During the concert in Berlin (13th november) at the end of City of Blinding Lights there was a wonderful moment on the screen. 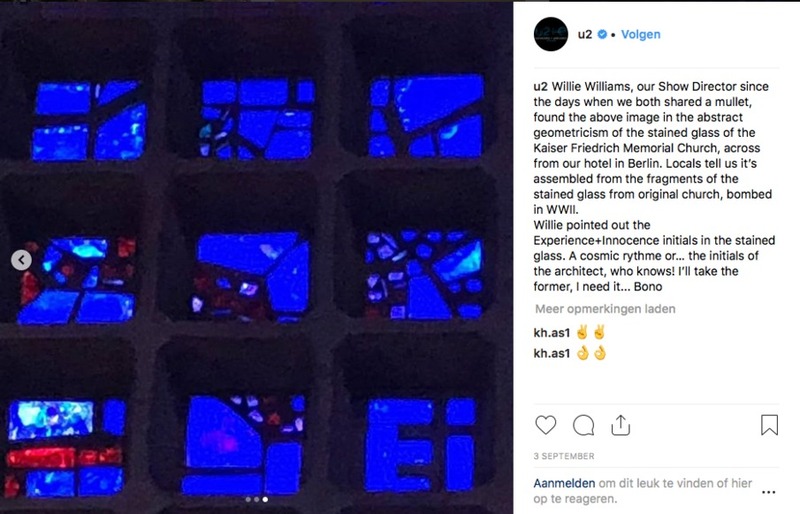 When U2 was in Berlin late August, early September, Willie Williams visited the Kaiser-Wilhelm-Gedächtniskirche (Memorial-Church) and post an Instagram message about it. In the glasses of the church he noticed the letters EI. Experience and Innocence. At the end of COBL, the graphic images of the city showed the memorial church and zoomed in on the glass walls of the octagonal church. 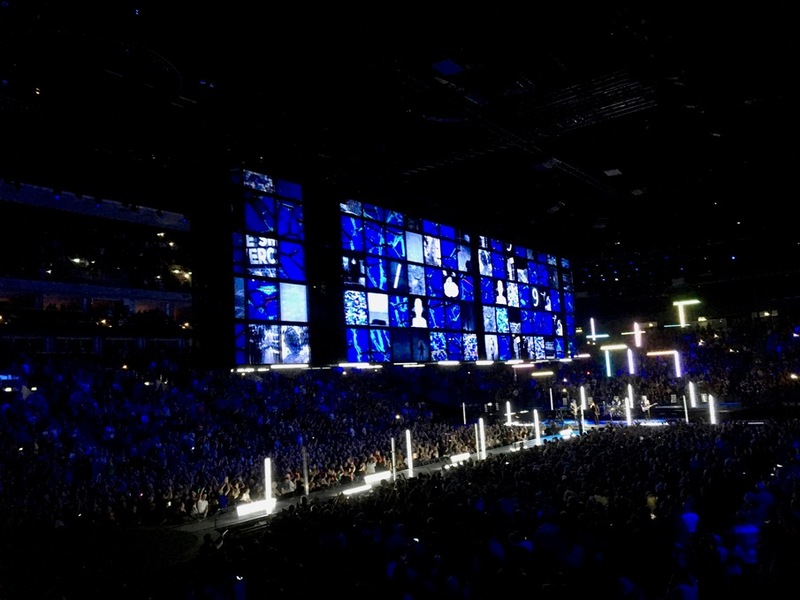 The screen was filled with square blue stained glass panes. Then in some squares all kinds of icons emerged that were a reminder of this tour. It was a very impressive picture, which ended with the square with EI in it. This visual completion of COBL was unique and made especially for this last concert. Really beautiful! Ps. This is a screenshot of the U2 Instagram Message about Willie Williams. A typo by Bono himself (rythme), you won't find that very often! "Don't call me Shirley." - Larry Mullen jr. in an MTV interview during the ZooTV period when the journalist said "Surely there's more to it than that". The inspiration for the song Lemon was Bono seeing his mother in some old movies wearing a dress with a yellow tint.